The fire is still at 95% contained. Some resources are being reassigned to other fires, remaining firefighters goal is to get 100% containment by end of shift today and turn the fire back to the San Carlos Ranger District Monday. The fire is now 95% contained. Firefighters are strengthening the fireline and working on hotshots within the interior of the fire. As of 6:30pm July 5, the fire is now 72% contained. 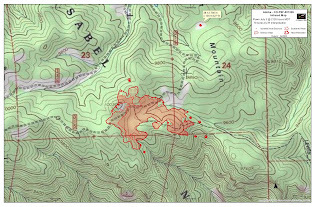 The fire is reported holding at 85 acres with 23% containment. There is a combination of dozer, hose lays and hand line on the fire and continuous suppression efforts using helicopters to drop water on the fire throughout the day. Due to the continued efforts to suppress the Adobe Fire all pre-evacuations in both the Freemont and Custer Counties are now lifted. This includes south of County Road 15 in the Freemont County to the Custer County line as well as the Adobe Creek, Trinity Ranch and TV Hills subdivisions in Custer County. If you have any questions regarding the Adobe Fire please email us at adobefire18@gmail.com or call 719-299-0574. Resources: 5 air tankers, 3 helicopters, 3 hand crews, 3 engine modules, 1 water tender. Additional support with single engine air tankers (SEATs) and heavy air tankers. Evacuation: Pre - evacutions have been lifted. Pre-evacuations were in effect South of County Road 15 in Fremont County to the Custer County Line as well as three subdivisions: Adobe Creek, Trinity Ranch, and TV Hills. Closures: Forest closure from Highway 96 to Oak Creek Grade Road and along the west and east forest boundary lines. The following map of the Adobe Fire was created using infrared data taken from an overflight of the fire on July 3rd at 11:30pm. Click on the link below for a larger view of the map.